I had grand plans for this outfit. It needed to be simple, wearable, and something that the girl agreed with. I let the girl pick both the patterns, and the fabric, so in theory it should be a winner?! The fabric arrived quickly from Olumis Fabrics, and went straight into the wash. I put all new cotton lycra fabrics on a quick 40º wash, then I put them in the tumble drier. EEK! I know, I know, you're not supposed to tumble anything with lycra, but I find it does a good job of shrinking the fabric before I cut into it. I don't put the finished garments back in the tumble drier as I find the lycra disintegrates and the garments become fragile and non-stretchy (ask me how I know!). 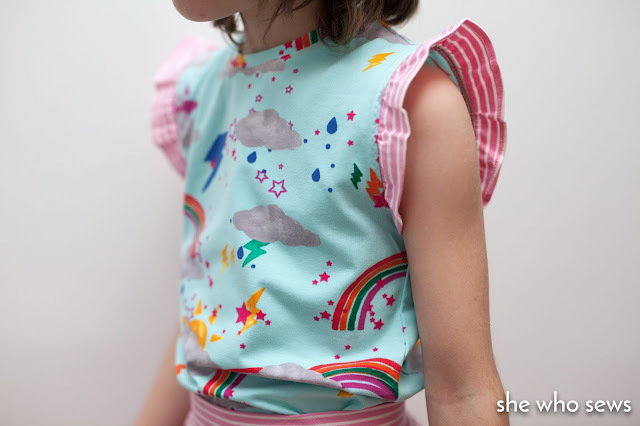 My daughter chose the Frill sleeve tee by Made by Me Patterns. This is a new to me pattern company, and I didn't really know what to expect. Their measurement chart gives height alone, and basing it off that, the size 7-8 yrs should have been correct for Layla. How wrong could I be? When cutting out the fabric, I didn't really think too hard, but in the back of my mind I thought it looked a bit large. So I sewed it up and it was huge! Here it is on Layla, like a baggy dress with sleeves like wings. Frankly, it fitted my 10 year old boy, and even then, the frill sleeves were like wings. The neckband was baggy, and overall it was a badly fitted pattern. So I cut the overlocked seams apart, re-cut the fabric in the equivalent age 5-6 yrs pattern piece, cut the frill sleeves in half and re-hemmed them. 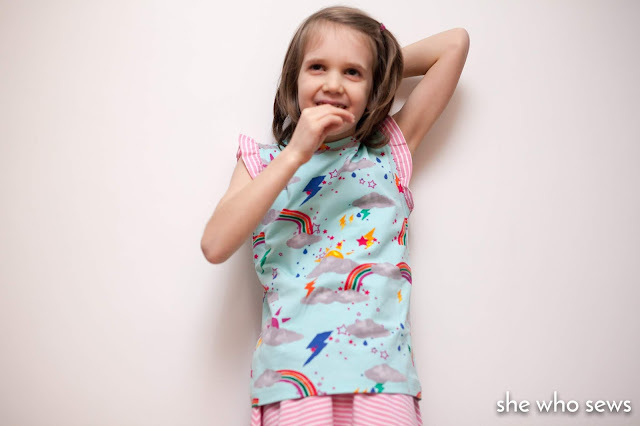 I used the 80% rule to make the neckband fit, and left it age 5-6 length. I didn't have any of the pink stripe left to make another neckband, so used the main fabric on this second version. Now the tee fits much better, but I'm still not entirely happy with it. I don't think I'll make it again. Something is not right with the armholes and frill sleeve, it just doesn't sit properly, and even with the much smaller frills, they still just stick out. But what about the fabric. Isn't this such a lovely print? Perfect for a stormy child, but happy at the same time. 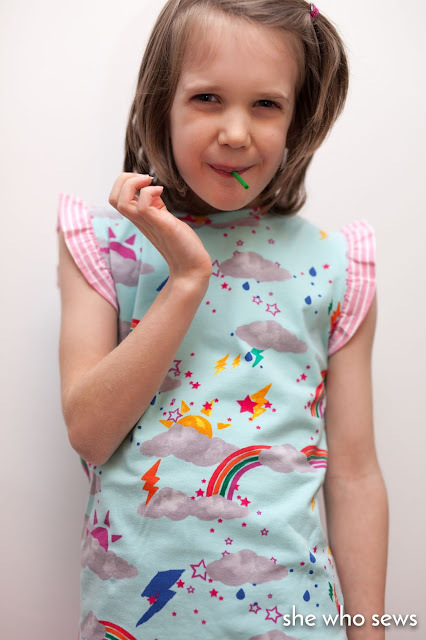 This is the Rainbow clouds and stars print in the mint colourway from Olumis Fabrics. It's a lovely pattern, but quite large, so perfect for a 7 year old's tee-shirt, but I do wonder whether it would work for a tiny baby top? I then used the candy pink and white stripes as the contrast frill sleeves to add a 'girly' hint to the tee. A fun frill sleeved tee has to have a skirt to go with it, right? And that's where this simple skater skirt fell into the outfit perfectly. This is another new to me pattern, but is a freebie by Love Notions. This sewed up easily and quickly, and was easy to adjust thanks to the size chart. I made age 8 length, with age 3 width, and it's a perfect fit! It is a simple two pieced skirt, with a yoga style waistband, all made from knit fabric. I used the candy pink stripe for this, and surprised myself with almost flawless stripe matching at the side seams!! I think this was helped by having beautifully straight fabric. Sometimes fabric turns up and the print seems off-grain, that's often down to stretching when being put on the bolt. But this stripe is the most perfect straight stripe I've ever laid my hands on. Once the weather warms up, I'm hoping this becomes a go-to warm weather outfit for the girl. It's soft, stretchy and easy to wear. The skirt has already withstood an hour and half long soft play birthday party! You couldn't tell from the pics, could you! ?